Whether you’ve dreamed of Montana fly fishing for years or you’ve yet to cast for the first time, you will not be disappointed by the opportunities on our namesake Rock Creek. 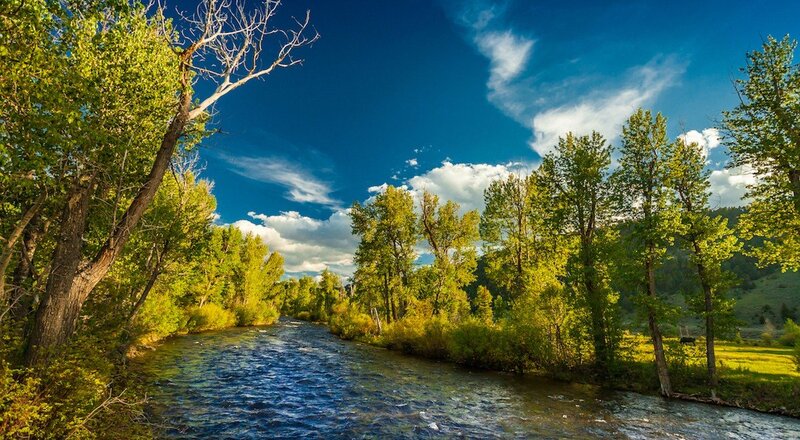 Four miles of private access and pristine river frontage on this freestone mountain stream boasts seven species of fish: Westslope cutthroat, rainbow, cut-bow, brown, brookie, bull and the Rocky Mountain whitefish. Rock Creek is famous for its salmonfly hatch starting in late May and lasting into July, as well as additional hatches including mayflies, golden stoneflies and caddis fly. Our licensed and trained fishing guides are excited to share their professional expertise and personal passion for fishing. They go above and beyond to ensure that your fishing experience is both enjoyable and successful. A Blue Ribbon fishery is a designation made in the United States to identify recreational fisheries of notable high quality. There are only five states in the U.S. with waterways that have been given the official Blue Ribbon designation: Michigan, Missouri, Montana, Utah and Wisconsin. Water Quality and Quantity: Must have adequate water quality and quantity to sustain a viable fishery. Water Accessibility: The water must be accessible to the public. Natural Reproduction Capacity: The body of water must allow for sustainable reproduction to maintain recreational fishing. Angling Pressure: The water must be able to withstand angling pressure. Specific Species: Selection may be based on specific species. Congressional Approval: Any waterway hoping to earn a Blue Ribbon designation must be approved through the U.S. Congress. Each day of fishing begins at the Rod & Gun Club, where you are outfitted with our top-of-the-line collection of rods, reels, waders and flies. Pull up your waders and venture into the stream for a one or two-hour fishing adventure on Rock Creek. To ensure preservation of the sport, The Ranch asks that all guides and guests catch and release all trout they hook while on Rock Creek and during off-site excursions. 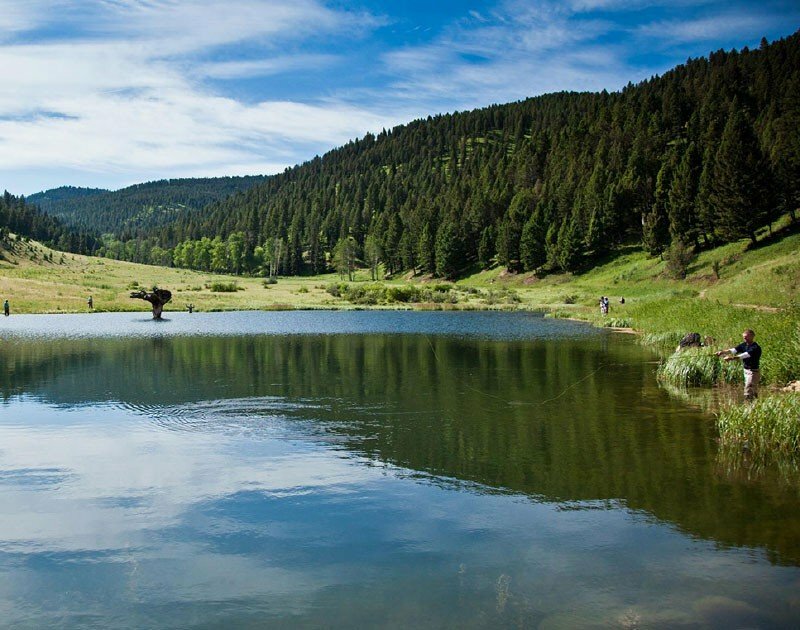 Our experts advise on how to hunt for the perfect fishing hole—so you can enjoy solitary, as well as guided fly fishing. Before heading out on the water, all guests receive personalized casting lessons and riverside instruction from our outstanding guides. Whether perfecting a double haul, casting into a gusty wind or simply getting back to the basics of a steeple cast, every guest will walk away with improved ability. Catching a trout on your own personally handcrafted fly is extremely rewarding. Learn the art of fly-tying with our guides before hitting the water. Guests discover how to wrap hooks with thread and materials to fool a clever trout. For those in pursuit of a big catch or just learning how to cast, a still water fishing trip to one of our trophy trout ponds will help hone skills between or before walking and wading on Rock Creek. We stock Cottonwood and Welcome Ponds with cutthroat and brown trout. Both of these ponds provide a unique ecosystem for trout species. Experience more miles of fishing and scenery with a guided private full or half-day float trip. 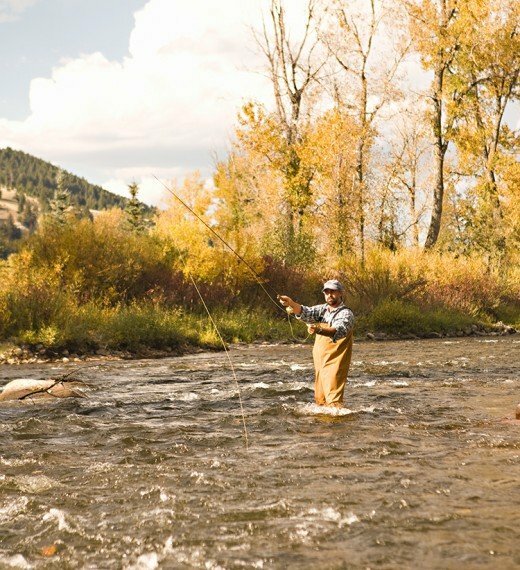 Enjoy a fishing float on Rock Creek in the spring, or explore more Montana waterways with an off-Ranch fishing excursion. 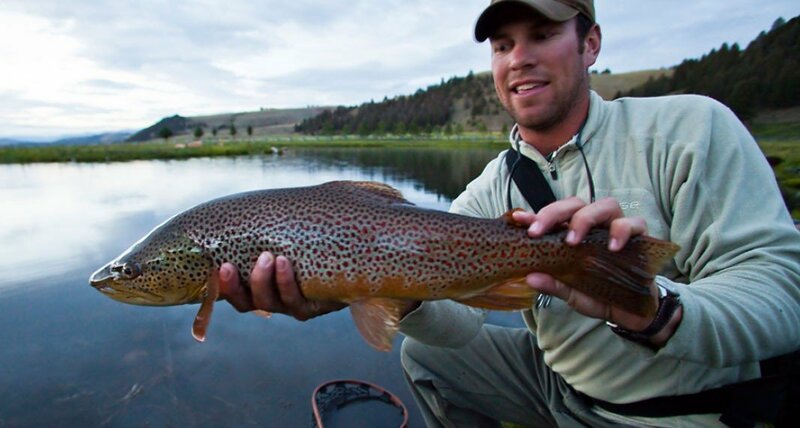 Several other of Montana’s most famous fisheries are within a 30-minute to two-hour drive from The Ranch. We can arrange special excursions or float trips at an additional cost. 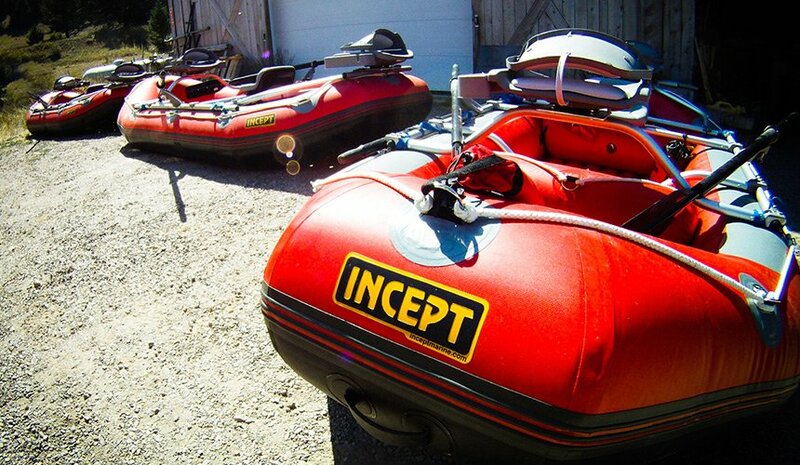 Fishing rafts accommodate two guests and one guide, with guides required on all floats. For off-site fishing, the destination is determined by our guide’s knowledge of current seasonal status for that location. We also choose rivers based on the guest’s ability and goals to ensure the best possible fly fishing experience for that individual. The Bitterroot: Approx. 1.5 hours over Skalkaho pass. The Bitterroot River flows through a prolific valley of the same name. This Blue Ribbon River is a favorite among locals and provides ample fishing opportunities for both novice and advanced skill levels. The Big Blackfoot: Approx. 2 hours northwest of The Ranch. Fish the river featured in A River Runs Through It—full of big bull, rainbow and cutthroat trout. Float trips follow 11 miles through The Box Canyon to Russell Gates, a section with epic scenery and holds some of the biggest fish. Best for intermediate to advanced anglers. Upper Clark Fork: Approx. an hour from The Ranch. This is the closest river to The Ranch and flows through picturesque old mining towns. The fish are large and have a voracious appetite for bugs and good looking streamers. This section has less pressure for anglers than the popular Clark Fork sections below Missoula, making it great for beginners. Can I bring my own fly rod and gear? What species of fish live in Rock Creek? Why is a float trip on Rock Creek only offered in the spring? 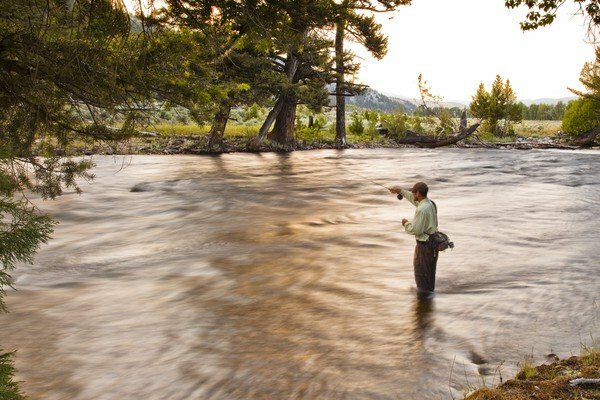 When's the best time to go fishing in Montana? Absolutely! While we offer everything an angler needs to enjoy our water, we under- stand how nice it is to have your trusted gear. All gear may be shipped in advance to The Ranch and will be waiting in your accommodation upon arrival. The Rod & Gun staff is also happy to assist you if you have questions about what to bring to The Ranch or if you are interested in purchasing gear from the Rod & Gun or certain manufacturers in advance of your trip. There are six different species of trout living in Rock Creek including cutthroat, cut-bow, rainbow, brown, brook, bull and rocky mountain whitefish. The creek boasts one of the highest fish populations in the state. Yes. 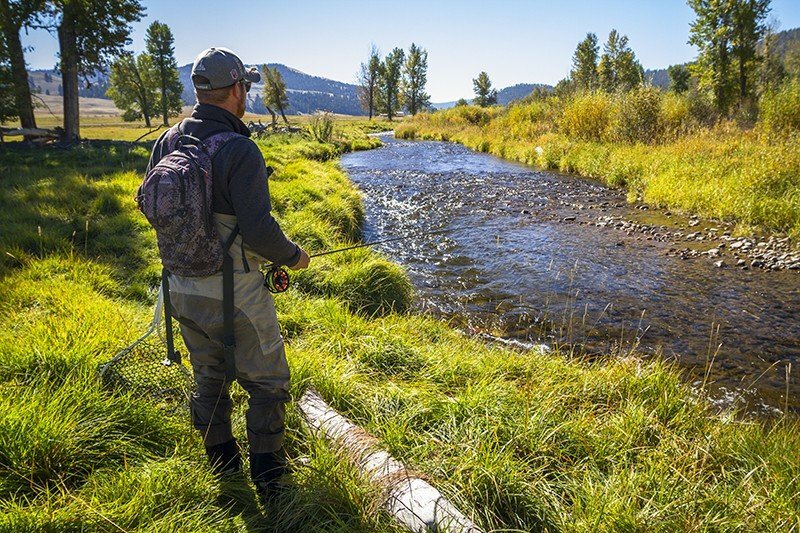 Montana requires that our guests purchase their licenses to fish, in addition to a $10 conservation license and a $15 Aquatic Invasive Species Prevention Pass. 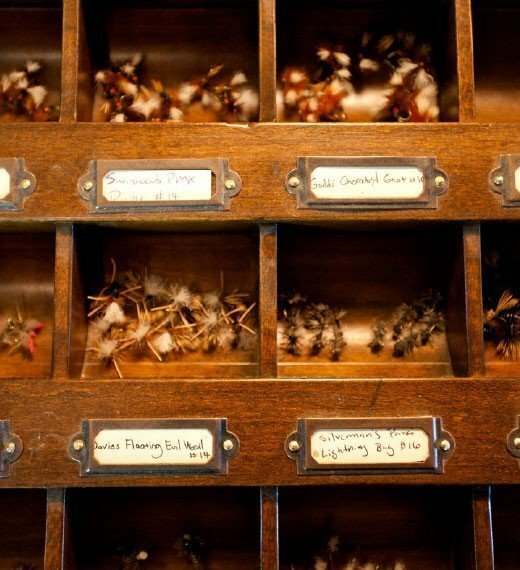 Our Rod & Gun staff will facilitate your purchase when you book your stay and plan your activities. Children age 11 and under do not require a license to fish. Non-Resident Montana Fishing License Fees are: 2-day for $50, 10-day for $81 and season licenses for $111. Fishing from a boat on Rock Creek is not permitted after June 30 per U.S. Forest Service regulations. 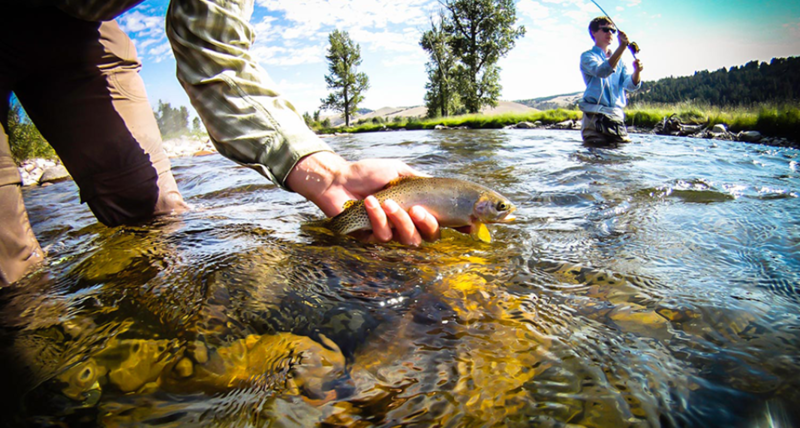 Our guides and guests often float, walk and wade on many other Montana rivers after June 30. 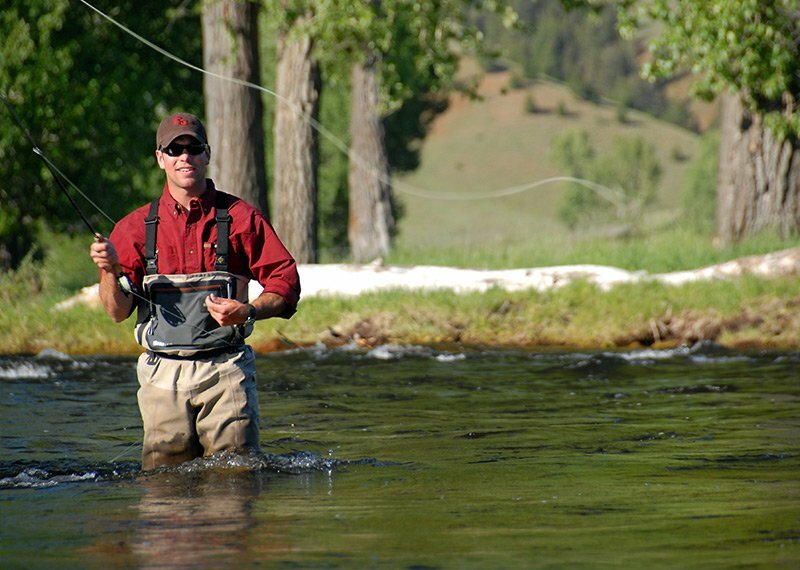 Off-Ranch fishing float trips on rivers, such as the Bitterroot, Clark Fork and Blackfoot can be arranged through the Rod & Gun staff in advance and at an additional cost. Guests are encouraged to pre-book fishing and scenic float trips to ensure that the dates that you prefer are available and arrangements can be made for you. Fly fishing is a wonderful family activity. 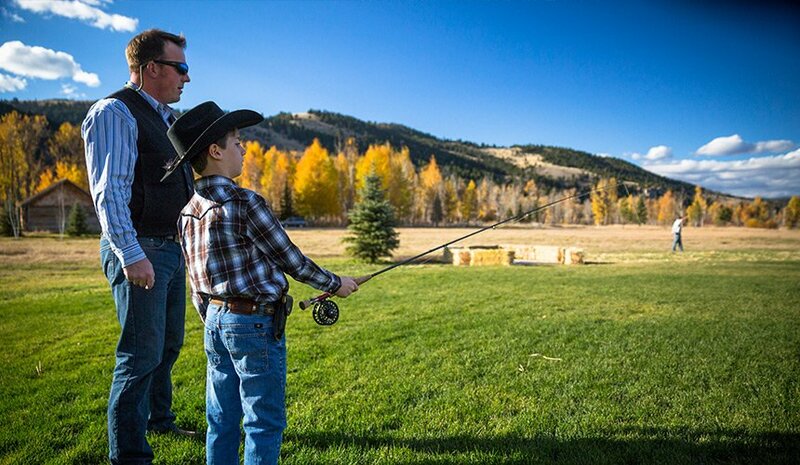 The Ranch encourages children of all ages to try fly fishing. It is offered to young guests (ages 4-12) in our Little Grizzlies Kids Club, and our guides are happy to arrange a family outing with multiple ages. Spring | After a long dormant winter, the fish are eager and hungry. Elevated water levels from the snow melt and rising seasonal temperatures cause an eruption of new bug life. This emergence of bug activity creates hungry and active fish. Summer | Warm summer days, crystal clear, mountain-fed waters and big bugs make sight fishing a thrilling experience during this time of year. 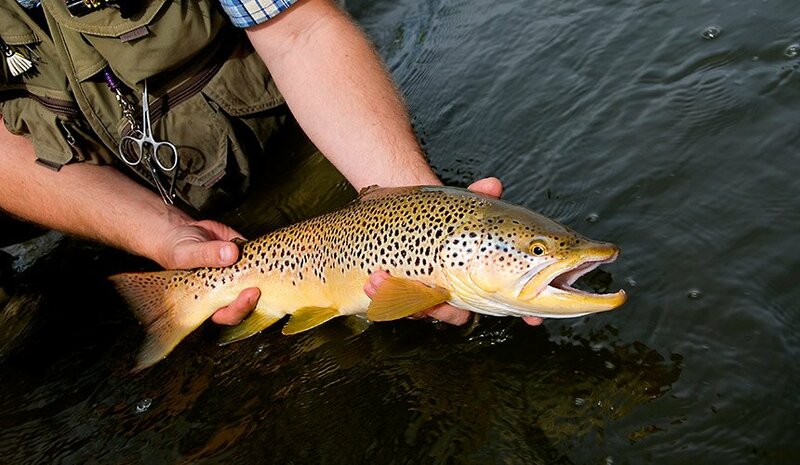 The summer hatch lasts well into the season when ants and grasshoppers make up the majority of the trout’s diet. Nymphing and streamer fishing can still prove productive, but neither is near as exciting as watching a large native trout smash the surface in pursuit of a juicy hopper pattern. Fall | The weather cools off around mid-September. Fish are bulking up for the colder weather on the horizon, meaning big catches. Crisp warm days can be followed by occasional frosted nights. The leaves along Rock Creek ignite into brilliant golden colors. The lower water levels mean that big holes are easier to fish.